We guarantee your pizza will be completely frozen by the time you get it. Fargo, ND – Not real stoked about going out into the arcticly crazy super-cold windchill temperatures for supper? 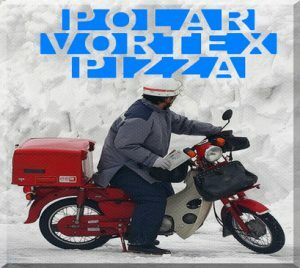 Maybe you should just stay warm at home while ordering a pizza from Polar Vortex Pizza! Their pizzas are great, and fully cooked in perfectly hot ovens, and then quickly delivered rock-hard frozen solid to your front door. The flash-freezing process take only seconds and locks in all the wonderful goodness of your Polar Vortex Pizza!